As Shrum Dances on DeLay's Grave, Matthews Applauds Him as "Solid on This Stuff"
Be the death literal or figurative, in recent days Democrats and their MSM claque have demonstrated a ghoulish penchant for dancing on the graves of their political opponents. As documented here, on the very day of his death last week, MSNBC's Alison Stewart, subbing for Keith Olbermann on Countdown, took nasty parting shots at Caspar Weinberger. 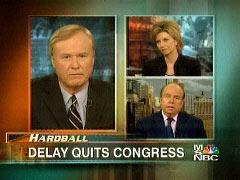 When it comes to combining campy, staged video with liberalism nobody tops Geraldo Rivera. On last night's Geraldo At Large, in a story about proposed legislation to lower the hunting age in Wisconsin Rivera, seen holding a rifle outside the Fox studios in New York, crouched down to get a child's opinion on the law: "So get this, there’s a new bill pending in the state of Wisconsin that would lower that state’s legal hunting age, putting loaded guns into the hands of children between the ages of eight and eleven. Kids like William here, making them bonafide gun-toting hunters. So what do you think of that idea William?" Rivera: "You hate it? Ooh!" Harry Smith: "Jane Bullock is a former Chief of Staff at FEMA." Michelle Malkin has posted an "apparent Dateline NBC solicitation to Muslim groups." With the comments about the April 1st weekend, perhaps we should hope this is an elaborate April Fools prank. If this is as authentic as John Green's "Bush makes me sick" e-mails, the most enjoyable part is how these anti-discrimination producers want to make sure their professional victims "look Muslim" and have full beards and skull caps, and then send them to a NASCAR race. (Hmm. The piece reads more as pro-gay mainstreaming than a news item, leading off with unusual criticism by a reporter of a question from another reporter. Networks ignore socialist Chavezs power grab, but attacked Big Oil just for making profits. The Washington Post isn't very good at hiding its feelings about abortion when it lets its political reporters profile the Washington elite in their Style section. The latest example was a star turn for Cecile Richards, the new leader of Planned Parenthood. By gum, she's a lovable, open, down-to-Earth girl, the perfect soccer mom -- who also just happens to run a chain of abortion factories. The Associated Press held their annual luncheon yesterday and invited media darling Senator Barack Obama to lay out the media's talking points for the next election. The only surprising thing about the event was that it opened with a prayer. Apparently Democrats want the press to focus on global warming as the core issue in the next election cycle. No doubt focus groups have reaffirmed that it is the only topic democrats can successfully obfuscate. If I may, I'd like to respond to one paragraph of Obama's message, and perhaps he can respond back to me - should he happen to be a faithful reader of Newsbusters. (14:49) "What we can be scientifically certain of is that our continued use of fossil fuels is pushing us to the point of no return. And unless we free ourselves from a dependence on these fossil fuels and chart a new course on energy in this country, we are condemning future generations to potential catastrophe. Since 1980 we've experienced 19 of the 20 hottest years on record." That's interesting, because since 1980 we've also experienced 28 of the 29 most powerful solar flares ever recorded. This just 400 years after a lack of solar flares, which just happened to coincide with the "Maunder Minimum", otherwise known as the Little Ice Age. In science, that's known as a pattern. Perhaps Barack can explain how fossil fuels caused NASA to detect a sharp increase in recent global warming - on Mars. And for three Mars summers in a row, deposits of frozen carbon dioxide near Mars' south pole have shrunk from the previous year's size, suggesting a climate change in progress. Perhaps it is all the SUVs used by Martian soccer moms. Even if democrats actually had a plan to move away from fossil fuels, they have no authority to force the rest of the world to follow it. It would seem the best play for democrats is try to make political inroads by continuing to blame man for all the problems in the universe. All the better if the media goes along with them. Now what are the chances of that? Conspiracy monger and Hollywood director Oliver Stone apparently isn’t happy with how some in the media – guilty as charged! – denigrate the political views of Hollywoodians. As reported by ContactMusic.com (hat tip to Drudge), Stone “has blasted media groups who ‘slander’ celebrities for their political comments - because intelligent stars have every right to question their leaders.” Intelligent stars? Now there’s an oxymoron. Lauer Suggests Bush's Religious Beliefs "A Get-Out-the-Vote Campaign"
You could see this one coming a mile away. 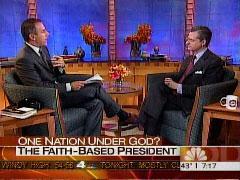 As soon as Matt Lauer announced that Today was inaugurating a series called 'One Nation Under God' on the role religion plays in our country, and that the first episode would focus on President Bush, you knew we were in for a bumpy ride. The New York Post reports that Arab news channel Al Jazeera is having trouble finding any U.S. cable providers willing to carry its new English-language channel. I’m really beginning to love Alec Baldwin. Honestly. You know, if you want to get a pulse of how the extreme left thinks in our nation, you can visit websites like Daily Kos, Democratic Underground, or Moveon.org. Maybe watch a Michael Moore “film,” listen to a Barbra Streisand tune, or even play a videotape of Howard Dean shouting non sequiturs at the top of his lungs...as if there was much of a difference. On the other hand, you can just as easily check out the most recent blog entry by actor Alec Baldwin at Huff-n-Puff. 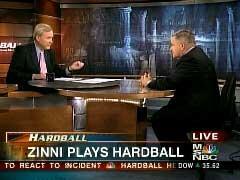 The beauty is that whether he’s making himself look like a vacuous political imposter on HBO’s “Real Time,” or auditioning for a position as a talk radio host in New York City only to be so embarrassed by callers Sean Hannity and Mark Levin that he is forced to stomp out of the studio like a two-year-old, Baldwin never disappoints. As reported by Newsbusters on Sunday (April 2, 2006), Middle Tennessee State University is hosting a journalism conference this week called, "Self-Inflicted Wounds - Fact and Fiction in Journalism: Fabrication, Plagiarism and Confidential Sources" (Al Gore is delivering an opening address.) Here's a question: On the topic of plagiarism, will the conference breach the subject of Al Franken? For those of you unfamiliar with the Hannity and Colmes dynamic, it's a conservative-versus-liberal talking head show, kind of a combination between Crossfire and a Harlem Globetrotters game.